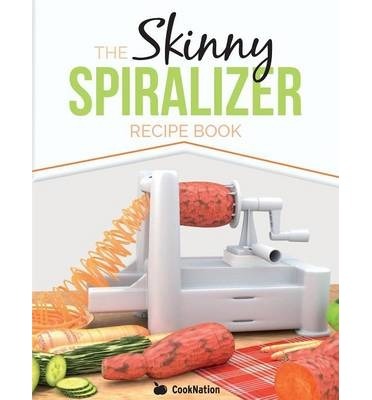 What is a spiralizer? Is it worth the money? Will this giant pencil sharpener actually get used or will it sit in its box at the back of a cupboard? However, a trusted friend said to me that she uses hers all the time. Consequently, I've done some research and have chosen to buy the Mueller Spiral-Ultra 4-Blade Spiralizer, 8 in 1 Spiral Slicer. I considered others, and I'll tell you how I arrived at the decision to buy this one when there are dozens to choose from. There is a massive choice of spiralizers. Hand held ones, table top models with a manual turning handle and electric ones. They differ in price from less than $10 to nearly $100 and the price doesn't always reflect customer satisfaction! You can buy electric machines, but I would not want a machine like this that had only one function. Some of the hand held machines get great reviews - they're cheap and work well for zucchini, carrots and other soft veg. 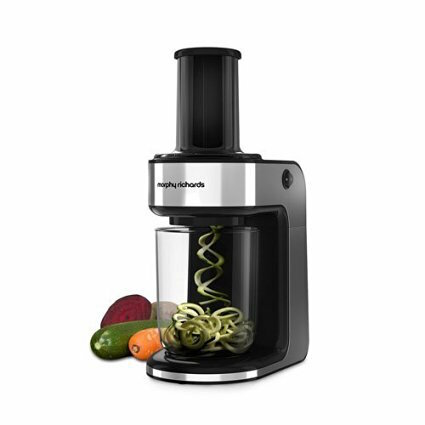 hard veg (butternut squash, sweet potatoes for example) can be difficult to spiralize, but that often depends on the size of machine that you buy. The larger ones cope better with hard veg - if you're going to do lots of zucchini and similar, then have a smaller, cheaper machine. If you would like to do harder veggies, then consider an electric or larger unit. The flags below will take you through to Amazon where you can read more about this model. The UK version is called 'Cuisique' but it is an identical machine. BE AWARE - there are two ways to put this blade in, one to use as a slicer and one as a spiralizer - watch the video to see the explanation. 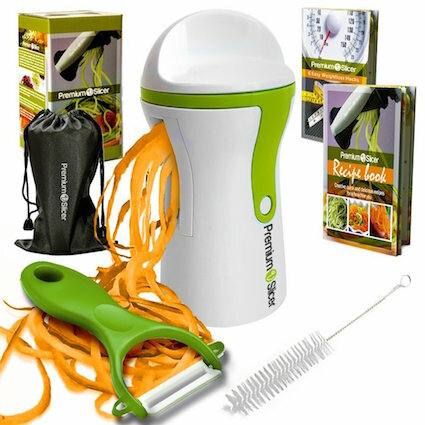 Many of the one star reviews are as a result of trying to use the blades in the mandolin position when spiralizing veggies. make sure the ends of your veggies are flat, that way you get the most even noodles. Trim them evenly. 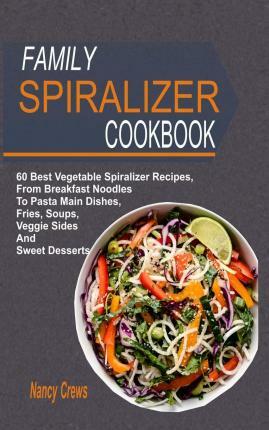 60 Best Vegetable Spiralizer Recipes, From Breakfast Noodles To Pasta Main Dishes, Fries, Soups, Veggie Sides And Sweet Desserts Here is a collection of recipes to make the most of your spiralizer. 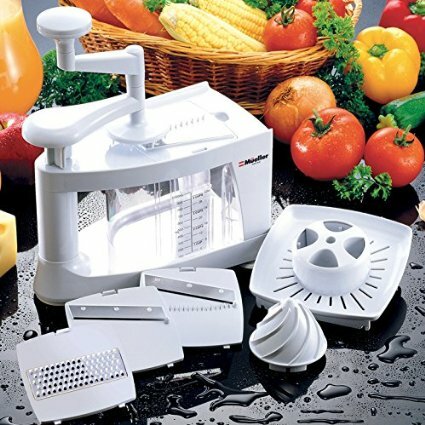 Your spiral vegetable slicer will no longer stay idle on the counter with these tasty and irresistible dishes! Spiralized vegetables are not just about healthy eating, they also provide a lot of fun for the whole family. Get your kids involved as you create colorful meals from breakfast to lunch, dinner, side dishes and dessert. The types of dishes you can make with spiralized vegetables is almost endless. 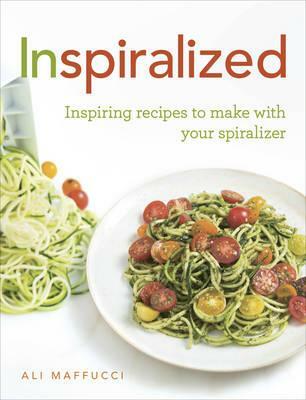 The 60 recipes in this book will enable you make flavorful, low-calorie and all-natural recipes with the use of your spiralizer. Vegetable-full meals hit the spot whether you want to slim down or just want to maintain a healthy weight. They are not only delicious and nutritious, they also fill you up and help you resist sweets and junk food. The best recipes require minimal effort to make. Sometimes, all you have to do is toss your spiralized sweet potato or zoodles with olive oil, sprinkle with your favorite spices and stick in the oven. A few minutes later, a delicious meal is ready for your family. 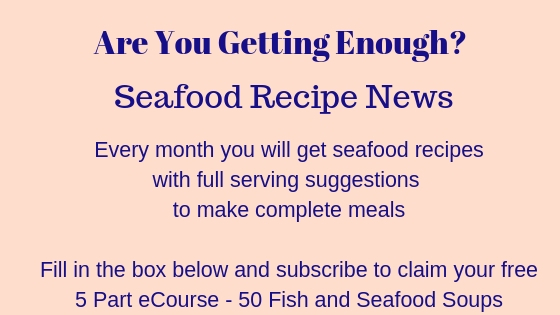 Get ready to open yourself up to a whole new world of possibilities....Our calorie counted low fat recipes will help you make the most of your spiralizer: serving up super-fast, simple meals, soups, sides, salads and more. With our recipes and your spiralizer, mealtime prep is fast and fun. Every skinny dish serves one and is calorie counted to fall below either 200, 300, 400 or 500 calories.Recipes include: Sweet Ground Beef & Zucchini Twirls Shrimp & Fresh Pea Noodles Veggie Lime & Cashew Stir-Fry Beef 'Noodle' Soup Skinny Sausage & Spinach 'Spaghetti' Fresh Lime Zucchini Ribbons Garlic Chicken & Cucumber Ribbons Honey & Thyme Egg Plant Onion & Balsamic Dressed 'Pasta' Spiralized Bubble & Squeak Sundried Tomato & Basil 'Pasta' Creamy Squash Sauce 'Spaghetti' Chicken Miso Soup Wok Egg Soup Sweet Chilli Prawn 'Noodles' Spiced Spinach & Spiralized Sweet Potatoes Beef Keema Fresh Tuna Stir-Fry Bean & Halloumi Ribbon Salad Sweet Potato & Porcini Spirals Skinny Sausage & Spinach 'Spaghetti' Pesto Chicken 'Pasta' Honey Chicken & Crunchy Carrot Stir-Fry Baked Sweet Potato 'Macaroni' Cheese Beetroot & Yogurt SoupPlus many more...... Get ready to be inspired with your spiralizer!